Put those in Illustrator vector format and what you have are graphics! 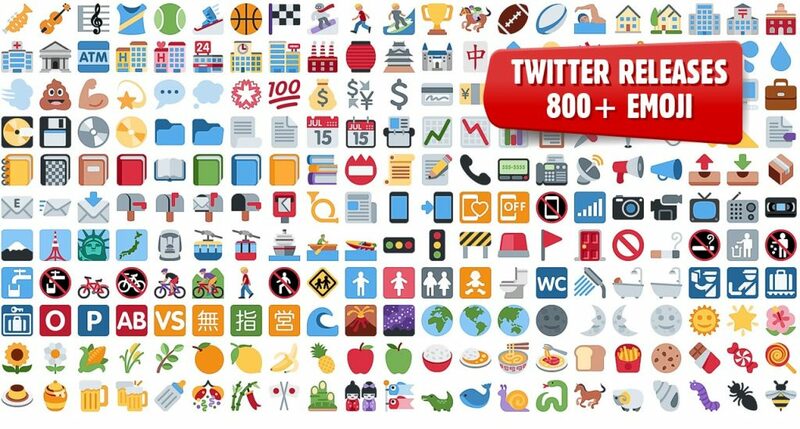 Twitter collaborated earlier this year with iconfactory to create a set of 872 emojis so that Tweets containing emoji characters would look as crisp on the web as they do in mobile apps. They have since released the whole library as open source on GitHub so that anyone can jump in and start using them in their projects right now. Before I tell you a little more about this release it’s interesting to note that a few weeks ago Google released their set of 700+ icons on GitHub as well (SVG, PNG and even hi-dpi versions) as part of their Material Design Project. I blogged about that here. For web developers the release of the emoji library comes as a .js file (even hosted at MaxCDN.com, a content delivery network) which you can reference in one line of code at your own site <script src=”//twemoji.maxcdn.com/twemoji.min.js”></script> and then use as you like. For graphic designers in their GitHub zip file download of 129MB with 3500+ files inside you can use rasterized PNG files at sizes 16×16, 32×32 or 72×72 or just go with the AI vector-based files so that you can make any of them any size you wish and retain razor-sharp detail. It is also true that in the downloadable zip file there are SVG files of each individual emoji character. What’s the value of such an open source download? It will be up to you to make of this news as you wish. Personally I don’t regard the visual integrity of the emoji as anything more than simple and cute. Communicating with friends—sure. Tweeting—sure. Something to enhance a project—I don’t think so.